A history of the discipline, and of myself. 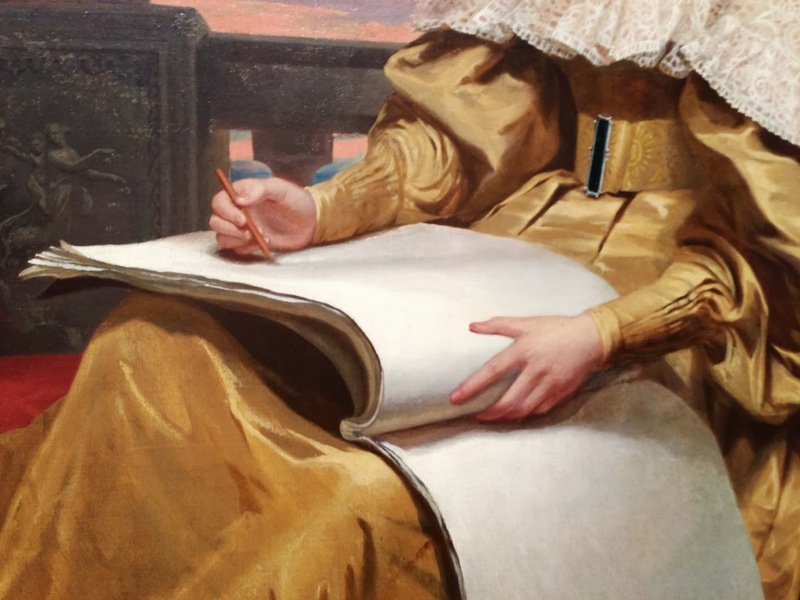 Samuel F. B. Morse, Susan Walker Morse (The Muse) (detail), 73 3/4 x 57 5/8, 1945. A few months after I turned sixteen, I began to keep a journal. I labeled it VOLUME I and titled it Journal of the 16th Summer of Alyssa Jean Pelish—anticipating posterity, if only in the form of my older self. I wrote in this journal daily, diligently, the only way I knew how. I had no models beyond the very general Protestant work ethic it is possible to glean from children’s picture books and Saturday morning cartoons and after-school reruns, which taught me that you win approval by, say, training your horse every single day, or, once you have planted a seed, by never ceasing to pull up the weeds and sprinkle water over the ground. Unstinting repetition was, therefore, my MO. As a result, VOLUME I has a high word count but a low rate of introspection. It sometimes reads as if it was written for some sort of psychic parole officer. Every single entry records what time I got up in the morning, what I ate for breakfast, what time I left the house, how many miles I ran or biked or swam, how long it took, and on and on. It would be possible to reconstruct any one of those days without gaining much knowledge of the person inside the head. I always framed events and references, even the fairly routine, as if I were presenting them to an uninitiated stranger, someone who had just happened to pick up one of these cheerfully bound journals and opened it at random. Reading these pages more than two decades later, it’s hard not to wince. I’m embarrassed by the young person who filled every single page of VOLUME I, making sure to begin on the very top line of every ruled page and to end each entry at the very bottom line, leaving no gaps or asymmetries. I pity her blithely compulsive tally of each day’s obligations and incidentals. I’m exasperated by how she glosses over almost everything that might actually matter. But what did you actually feel? What did you actually think? Can’t you explain it any better than that? It’s me you’re talking to, I want to say. The project wasn’t entirely foreign to me. On various family vacations, I’d watched my parents keep a “travel diary”—a list of the names of tourist sites and restaurants we’d visited, sometimes punctuated by a brief description of the weather. This struck me as an unrewarding chore, a kind of clerical work. I can also recall a unit in eighth-grade English that required us to keep a journal, which I maintained diligently but not without some paranoia, as we were sporadically required to hand in these accounts like so much homework. Not so long after that, in ninth grade, my first year of high school, I made intermittent entries in two different notebooks (the first of which was later torn into pieces and consigned to the bottom of a trash bag). All of these efforts were pressed onto the pages of ordinary spiral-bound notebooks, the kind I did my homework in. But what my parents had presented me with on my sixteenth birthday was something that was already a book: hardbound with a decorative pastel floral cover that, now that I see it again, recalls my bedroom wallpaper at the time. This was a volume I was meant to keep. Only the pages had yet to be filled. “The first thing to do in beginning a journal,” an 1878 article in the popular American children’s magazine St. Nicholas counsels its readers, “is to resolve to stick to it … A journal, or diary, should be written in every day, if possible.” I applied myself to VOLUME I as if a copy of that article had been Scotch taped to the inside cover. “Set down the date at the head of the first page, thus: ‘Tuesday, October 1, 1878,’ ” St. Nicholas says. “Then begin the record of the day, endeavoring as far as possible to mention the events in the correct order of time—morning, afternoon and evening.” And here we have the basic structure of a VOLUME I entry. There was, I am sure I felt, something virtuous about this daily, orderly accounting. Not surprisingly, the discipline of the diary is rooted in Protestantism. In the sixteenth century, English Puritans were beginning to use paper manuscripts to document their behavior for the eyes of God. While Catholics could unburden themselves of their sins with a trip to the confessional, the Puritans, having no such recourse, recorded their trespasses on paper. One sixteenth-century preacher’s diary consists of little more than daily lists of his sins (oddly enough, the specificity and comprehensiveness of each list almost takes the shape of an entire day). Notably, this preacher lists among his sins the days that he has neglected to record his sins in his diary. In nineteenth-century bourgeois households in the United States, keeping a diary was promoted as a means of instilling discipline and good character in children, especially girl children. Daughters, as a matter of course, were given more leisure time than sons, and they were expected to devote these otherwise idle hours to refining activities such as language lessons, needlework, and practicing the pianoforte, as well as taking exercise. In their diaries, they would record their obedience to their daily schedule. Parents—as my own had done—were typically the ones to present their daughters with lovely marbled diaries. They would often monitor their use and, undoubtedly, restrict their content. This seems like a small recompense for all those pages, all that discipline. Decades after the fact, I want something more. I want a clearer window into what it felt like to be me, all those years ago. I want honesty. But that’s a tall order: at sixteen, I had trouble enough locating the obscure country of my self, let alone articulating what I found there. Within the neat margins, the orderly accounting, is there actually anything more to see? Maybe. In fact, I’ve been playing just a little bit dumb here. I’m not so entirely in the position of the baffled archeologist staring at faded handprints on the wall of a cave. There is, undeniably, a connection between the closed-off bookkeeper responsible for VOLUME I and the person I am now: because, what she refers to, I remember. “[MT], a good friend of [my older brother’s], came over and we played Balderdash with Dad,” reads an entry from Sunday, July 17, 1993. “It was pretty fun. We drank strong coffee and listened to music as we played.” Any other reader wouldn’t see much in these three flat sentences. I cringe at their empty affect, but I also am reminded of what it felt like to sit around that table playing a word game in our small party of four. I am reminded of how clever my shaggy-haired, pot-smoking, coolly ironic older brother seemed to me, how unfettered he was by anything like the rigidity of routine that I clung too—and how much, oddly, I wanted his approval. Evenings like the one noted in this journal entry, when we played a game of writing fake dictionary definitions, were the closest I ever came to feeling like I had it. But that feeling always ended when the game did. Is that why the bland assessment “pretty fun” seems half deflated to me as I read it now? I recognize fragments like these only from a distance; they do not rise up, wholly reconstituted in me. And yet, remembering them at all, even from a distance, feels like something—it reminds me of the disparity between what I felt and what I felt I could show. I remember how I was, at that age, striving so doggedly but so blindly to approximate some standard of normalcy that I couldn’t define but that I knew other, normal people could discern. Reading the banal pages of this journal reminds me, more than anything else, of the disconnect between what I thought I was supposed to feel (what a normal person would feel) and what I actually felt. This disconnect followed me for a long time. It’s always there, a hitch or hiccup in the otherwise smooth surface of a day. Single sentences that suggest the other half of the story: “Her party just made me feel depressed. … He is a nice person, very friendly, but a little too “something I don’t like” for me … I want to be normal, but I’m unable to do it.” It was only years after VOLUME I that I realized the disconnect was the thing I needed to write about. Alyssa Pelish writes, edits, and teaches in New York. Her work has also appeared in Harper’s, Slate, Science, The Smart Set, The Los Angeles Review of Books, and 3 Quarks Daily. This piece is taken from an episodic memoir of childhood and adolescence she’s working on.